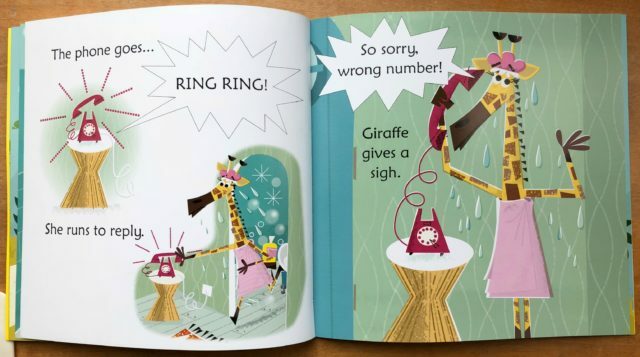 Giraffe in the Bath by Russell Punter and David Semple is a cute little book which encourages phonemic awareness. In addition to learning “a” and “i” sounds, your child will enjoy a funny story about a giraffe who just wants to take a bath. Giraffe has been working in her garden. She is tired and dirty so she wants to take a bath. Just as she gets all comfy in her tub, she is disturbed by a series of interruptions. 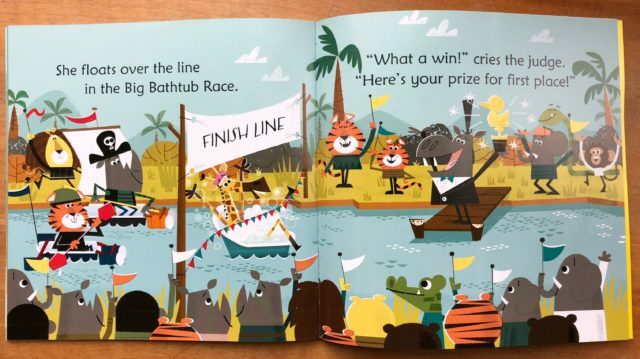 The last interruption is a doozy that sends Giraffe on an unexpected “adventure.” She ends up riding the tub down a slop and into a river until she surprisingly wins a river race. My little learners enjoyed the story. They loved the illustrations which are credited to David Semple. The ryhmes made them giggle. This story only takes a few minutes to read. It is perfect for times when you only have a few minutes to spend some quality time reading with your child. The book was first published in 2017. It’s a paperback. Further credits go to Alison Kelly and Anne Washtell who served as reading consultants. 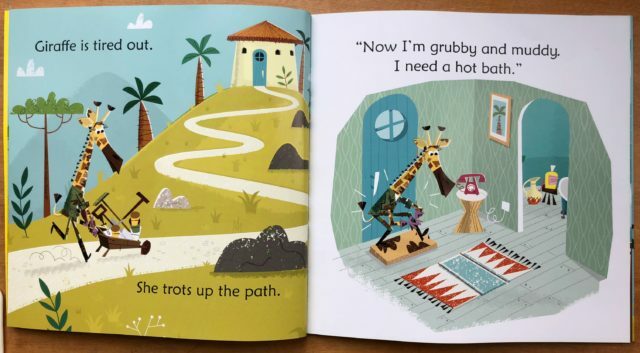 Giraffe in a Bath was edited by Jenny Tyler and designed by Hope Reynolds. At the end of the book, parents are offered more information about phonics and phonemic awareness. Parents are encouraged to go to www.veryfirstreading.com for more information and resources. British parents are encouraged to go to www.usborne.com/veryfirstreading. As far as Giraffe in the Bath goes, I spent some time creating a few simple activities to go along with the book for my little daycare kiddos. First, you’ll want to order the book from my Usborne Website here. Then, download the following FREE PDF document. you’ll find a writing page for children who are learning to write. There is also an upper case/lower case letter matching page and a giraffe coloring page. Then, you can cut out 13 flash cards with words from the story. Finally, there are 6 giraffe themed shape cards. Get all the above resources FREE by clicking the link below! 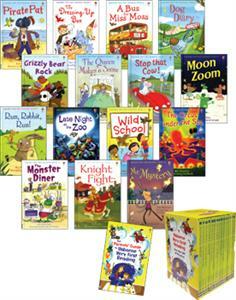 If your child is just learning to read, you’ll be interested in the Very First Reading Box Set. Usborne Very First Reading is a fantastic series of fifteen books for children who are just starting to learn to read. It offers the appeal of imaginative rhyming stories and irresistible illustrations, the support of a well-researched framework, and the enjoyment of shared reading with an adult (or other stronger reader). Listen in as Peter Usborne explains this incredible program: Watch a video here! 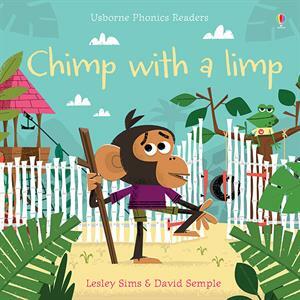 You won't believe chimp's tall tale of how his limp came to be in this lively story with humorous illustrations, ideal for children who are beginning to read for themselves or for reading aloud together. With simple rhyming text and phonic repetition specially designed to develop essential language and early reading skills. Guidance notes for parents are included at the back of the book. Check it out here. 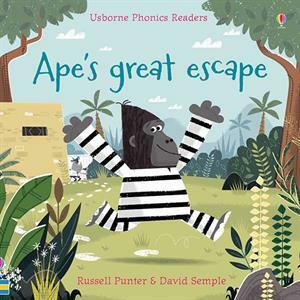 Ape's in chains for stealing grapes... find out how his great escape goes with this lively story and humorous illustrations, ideal for children who are beginning to read for themselves or for reading aloud together. With simple rhyming text and phonic repetition specially designed to develop essential language and early reading skills. Guidance notes for parents are included at the back of the book. Check it out here.